Hi-Tech White 6" Microfiber Bonnet makes removal of wax, sealant, glaze and polish residue or haze a breeze on your dual action polisher. The even surface contact will make the removal not only more efficient but also much quicker than by hand. Simply stretch the Hi-Tech White 6" Microfiber Bonnet over a soft 5.5" to 6" foam pad then glide your DA polisher over small sections at a time to reveal a haze free high gloss shine. Be sure to reach for a fresh microfiber bonnet when you switch from your polish to wax, sealant or glaze. 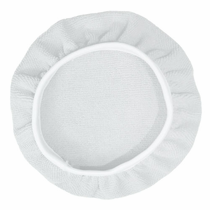 Hi-Tech White 6" Microfiber Bonnet Care Instructions: After use wash your Hi-Tech " Microfiber Bonnet in your washing machine with warm water and laundry detergent that is free of perfumes, dyes and color. Wash only with other microfiber items as other fibers will cling to the microfiber and load up reducing the efficiency of the microfiber for future use. Do not use fabric softener. Dry the Hi-Tech Microfiber Bonnet in the dryer on low heat without the use of dryer sheets.